The simplest and most cost effective way to transform your home is through an interior painting project. Interior painting allows you to make over a single room or your entire house and can substantially increase your home’s value, especially if your current paint is scuffed or marred or if the colors are alternately garish or drab. Further, if you’re selling your home, a complete paint job in bright, neutral tones makes it easier for prospective buyers to envision the space as their own, thus increasing your chances of selling. While MyHome specializes in removing the headache of painting your interiors yourself to free up your busy schedule, for those who do choose to personally undertake an interior painting renovation, the savings can be significant. The process can also be so remarkably time-consuming that it may take several weekends and evenings to complete. And since poor preparation for interior painting can result in sloppily covered walls that will need to be repainted much sooner than expected, rushing any step along the way isn’t a good idea. So for many in New York City, working with an all-in-one renovation team like MyHome is just common sense. MyHome’s team—from our Consultants who help select your paint colors, sheens, faux painting techniques and paint brands to our highly skilled teams of painters—ensures your project will be completed professionally, on time, and on budget. Preparation is extremely important – especially when painting a furnished apartment. Proper handling of your furniture and belongings is essential since you won’t want paint spatter on anything. You must pack all your small belongings (books, picture frames and knickknacks, etc.) in boxes for the duration of the paint project. If you ‘d like, the MyHome team can assist you. We will cover your floor with construction paper (or in some cases with masonite) , we don’t use cheap drop cloths like other contractors. We also apply blue tape to the areas that will be painted later. For example, tape is applied to the space between the wall and ceiling. Using blue tape is important because it won’t pull off paint when the tape is removed. All metal and woodwork is referred to as “trim.” This includes crown and base moldings, windowsills, frames, doors, built-in cabinetry, and radiator covers – basically every painted surface that are not walls or ceiling. Usually the trim is painted in a semi-gloss finish for best protection. Often, the older the apartment, the worse the condition of the trim. It usually has layers of paint and chipped or damaged areas. If you are looking for perfection, it may be best to replace it with new trim. If you just want to fix it up a little, it is possible to fill in some bad areas then sand, prime and paint. Some older apartments have beautiful exotic wood detail that may be worth stripping and refinishing. This option is detail oriented, time-consuming and costly. Priming is the process of applying a primer or base coat to the surface to be painted. 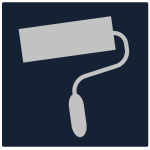 Priming is recommended in every painting project and is an absolute necessity in some cases. For example, you must use a primer if you are painting an area that’s been repaired or patched, a water-damaged area or if you are attempting to a paint light color over a dark one. The primer acts like glue for the paint, enabling it to adhere to the wall. Even if you are on a tight budget or are painting the exact same color, we recommend priming. By far, the best approach is to apply at least two coats of paint to all surfaces. In some cases a third coat may be needed. If you are on a budget, it is possible to apply only one coat of a special, thicker paint. MyHome recommends two brands of paints – Benjamin Moore and Sherwin Williams. Benjamin Moore is readily available and can be found in Janovic stores throughout Manhattan. It is the more recognized brand in the tri-state area and it offers more finishes. Should you want to look at color swatches, you can find them easily in your local paint store. Sherwin Williams is also a great national brand but it is not easy to find in local stores. If you want to save money on paint, it is a great option since it can cost up to 40% less than Benjamin Moore. Once you’ve chosen the color, you’ll need to select a finish. Generally, ceilings are painted with a flat finish. Bathrooms, kitchens and trim are painted with semi-gloss since it is more durable and easier to clean. Semi-gloss is not recommended for walls other than in kitchens and bathrooms because it highlights every imperfection. Walls in other rooms can be painted other finishes you like. The most popular flat finish is eggshell. Special finishes such as pearl and satin are beautiful but are significantly more expensive. Painting introduces an endless amount of possibilities to change the appearance of your interior space. Faux finishing takes that to a whole other level. Faux finishing is a special technique used in order to achieve a custom pattern of paint application. It has become extremely popular during the last decade especially in urban areas such as Manhattan. This unique finishing technique allows the artist an unlimited amount of styles and patterns to work with. The basic concept is to apply one base coat in a uniform color and than set the tone with the glaze coats. The glaze coats are a different color, which when applied is added as a second or third color to the base coat. Depending on the artist’s style and the application method, the texture is decided. You can use different techniques and tools that are more common such as sponging, combing, ragging, and brush strokes or create your own individual texture. One of the most popular applications in New York City is called Venetian Plaster. This application, which was very common in Italy beginning in the 19 th Century, is a local favorite because it creates a marble look and a smooth polished feel. When faux finishing, the only limit is your imagination. You can use it throughout an entire space or only highlight one small section such as a kitchen back-plash. MyHome’s faux finishing artists have all the tools, skills and experience to use faux finishing in order to turn your dream into a reality.